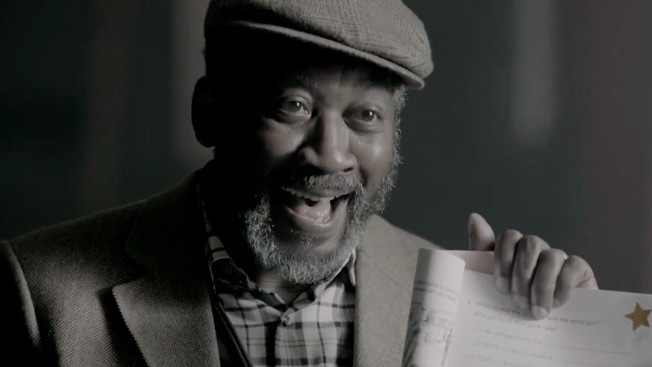 Scotch whisky brand Bell's and ad agency King James might just lift your spirits with this South African ad with an elderly man struggling to overcome his illiteracy so he can celebrate a family milestone. Director Greg Gray of Velocity Films employs a restrained cinematic style to show "The Reader" diligently practicing his A-B-Cs at every opportunity. There are some deft details: Our hero initially misspells "Kat" while playing Scrabble but gets it right later on, and he places cards reading "Kettle," "Oven" and "Taps" on corresponding objects around his home. The literacy angle might sound like a stretch, but the idea of celebrating personal triumphs by toasting with Bell's feels on target, and the heartfelt acting and storytelling are strong enough to yield a potent emotional payoff. Indeed, good scotch should leave you with a warm feeling inside.